The safety you expect from a cephalosporin. The power of an injectable. Events reported during the preapproval target animal safety studies. The clinical efficacy and safety field studies. The class effects described on the CONVENIA U.S. label and in the veterinary literature for the β-lactam group of antimicrobials. CONVENIA has been used concomitantly with many medications, including antibiotics, parasiticides, NSAIDs, vaccines and anesthetics. A total of 320 dogs (maximum age 19 years) and 291 cats (maximum age 21 years) were included in a field study safety analysis conducted in 26 veterinary hospitals in the United States. 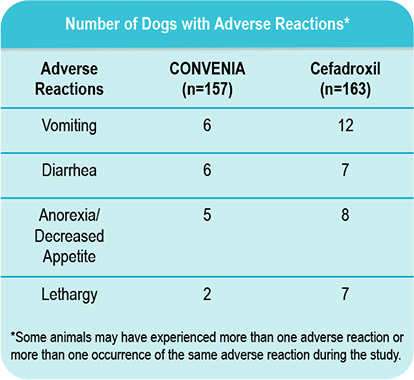 CONVENIA was tested at 1.5 times, 4.5 times and 7.5 times the label dose every 7 days for a total of 5 injections in dogs and cats. 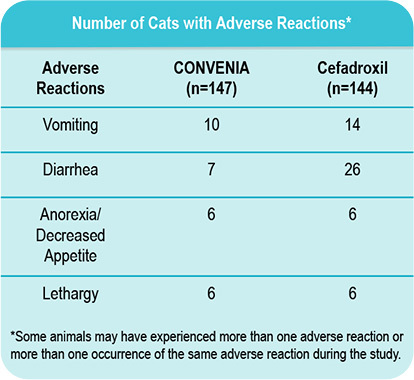 CONVENIA was evaluated in a single injection 22.5 times the normal dose in dogs and cats. Occasional gastrointestinal signs were observed, with the incidence increasing in a dose-related manner in the laboratory studies. Mild elevations in BUN and/or creatinine were observed in a few dogs and cats in laboratory and field studies and were not associated with clinical signs of organ dysfunction. Some injection site irritation, vocalization and edema were observed following injection in the groups given 22.5 times (180 mg/kg) the label dose. The edema resolved within 8–24 hours. When injection sites were evaluated histopathologically in cats, minimal signs of active inflammation were observed in only a few cats even at elevated doses (1 given a placebo, 1 given 4.5 times the label dose and 1 given 7.5 times the label dose). Zoetis supports the responsible use of antibiotics in animals and people.